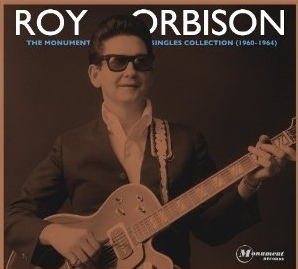 Just like Elvis Presley’s ‘50s Sun Records and RCA recordings are an essential part of rock history, so does the great Roy Orbison’s output for Monument Records in the early ‘60s. Orbison may not have had the looks and charisma of Presley– but like the King, Orbison set a benchmark on the charts thanks to a string of amazing and now-classic hits between 1960 and 1964, collected here on this new compilation. With a killer combination of a dramatic and haunting voice, and backed up by lush arrangments especially on the ballads, Orbison infuses romance and heartbreak in his songs whether it’s “Blue Angel,” “Only the Lonely,” “Running Scared” or “Crying.” Naturally, Orbison’s signature song, the sly rocker “Oh Pretty Woman,” is here in this collection from his greatest era, and it’s still timeless nearly 50 years later. His influence still permeates to this day (i.e. Bryan Ferry, Chris Isaak) and the Monument singles are a testament to his legacy.